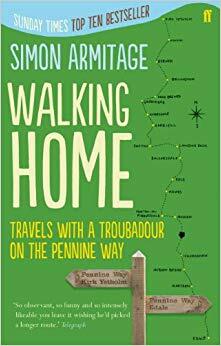 Walking Home is an account of Armitage's attempt to walk the 256 miles of the Pennine Way. Whereas most tackle the route from south the north he decided to reverse the route and start in Kirk Yetholm, where he was refused the privilege of signing the book of finishers on account of just beginning. This back to front journey would have him walking to his childhood home of Marsden. His chosen route threw up some interesting challenges, not least having to navigate in the opposite direction. He realised at several points that were he walking in the conventional direction the trail would build up to spectacular features whereas he would witness them first, diminishing what followed. Part of the challenge was to go penniless and rely on poetry readings en route for money, and the kindness of strangers for somewhere to sleep (and transport the bulk of his luggage in a large suitcase, affectionately referred to as The Tombstone, to his next stop). This was of course made easier by his being one of Britain's best known poets and the benefits of modern technology allowing for broad publicity before he set off, ensuring he had a reliable host and event organiser at each day's destination. This does not of course detract from the effort involved in undertaking the walk and spending his evenings performing rather than recuperating. The readings took place in varied venues from village halls, pubs, and even a host's living room, with equally as varied audiences and distractions. Part travelogue part memoir, this is an amusing tale of endurance on Britain's oldest, toughest National Trail.